I’m excited to announce that eNeighbors will unveil DIMBY.com on Friday, September 2nd, 2016 at 3pm. DIMBY will replace our eDeals program. eDeals had a good run – but the 202nd offer – the last offer to be made through eDeals – will end on Wednesday, August 31st, 2016. In total, the eDeals program saved Kansas City homeowners over $4 million and generated more than 50,000 new customers for local businesses. But we think eDeals was just the beginning of something bigger. So we devoted all our resources to building a new website, completely dedicated to saving you money and growing local businesses. DIMBY promises to be the future of how local home services are bought and enjoyed – together with your neighbors. Emailing your neighbors got a little easier this morning. First, many residents have requested a way to save the messages that they send to their neighbors, so we’ve added the ability to email a copy of your message to yourself. In the screenshot below, you can see that there is a new checkbox called, “Send a copy of this email to me.” This is the default setting. If you don’t want a copy sent to you, simply uncheck the box. 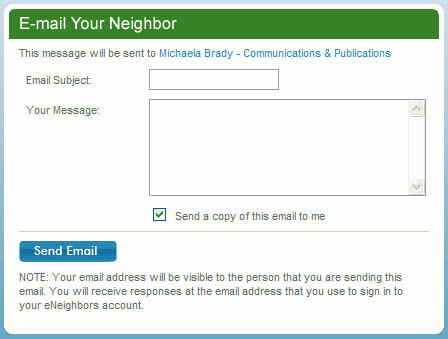 Second, and more importantly, your email address will now be included in the email that you send to your neighbor so they can reply directly to you, without having to go back to the website. And finally, we still do not display email addresses anywhere on the website in an effort to protect our users from SPAM and other unwanted email.